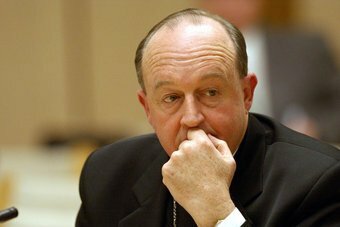 Adelaide Catholic Archbishop, Philip Wilson (pictured above) was director of Religious Education for the Newcastle-Maitland diocese and a teacher at the St. Pius X High School in Newcastle at the time of serious abuses there (see previous posting). Peter Gogarty was a victim from this time and has expressed disbelief that Wilson knew nothing of the abuses at the school. Both Wilson and Mr. Gogarty are due to give evidence to the New South Wales government inquiry into clerical abuses in the Newcastle-Maitland diocese in the next couple of weeks. In an earlier posting, the fact that Wilson will be permitted to give his evidence in private was criticized. This criticism remains valid. It was also noted that Mr. Gogarty was to give in-camera evidence, and this was considered “fair enough,” at the time. However, that was on the assumption that it was Mr. Gogarty’s choice. It now transpires that it was the decision of the Special Commissioner, Ms. Cunneen, and not Mr. Gogarty’s wish at all. Indeed, Mr. Gogarty wants to give evidence in public and is offended that he will not be given the opportunity by Ms. Cunneen. Peter Gogarty says he is disappointed Wilson will not have to appear in open court. “There are a great many people who have an interest in what he’s got to say and again, unfortunately, people are going to be left very disappointed,” he said. Mr Gogarty reiterated that he is angry his own evidence will also be heard in-camera. “I have been very vocal about this issue publicly for several years and I very, very much wanted the opportunity to be able to tell my story in public. I wanted to do that in a courtroom, and then for anybody who thought they had an interest to scrutinize my story. I was desperately desirous to do that in a public courtroom,” Peter Gogarty said. Detective Chief Inspector Peter Fox says he understands the frustration expressed by Mr. Gogarty. “Sadly he didn’t get the opportunity to give evidence at trial (the abuser died) and I think he was very much looking forward to his day in court,” he said. Mr. David Shoebridge, MLC, has also raised the issue of the in-camera appearances, in the New South Wales parliament. It is no wonder that many people feel the NSW enquiry is a sham, and proceedings to date, including the above issue as well as the personal attacks on Detective Chief Inspector Fox, have proved the point of moving on to having a full national Royal Commission. Bishop Wilson should not be permitted to be an invisible man, and Mr. Gogarty should not be forced to be equally invisible. Watch this space. [Postscript: The New South Wales government has announced an inquiry into the shredding of documents of police liaison meetings with the Catholic Church, by Inspector Beth Cullen]. This entry was posted in Uncategorized and tagged (Australian New South Wales Government) Special Commission of Inquiry into Matters Relating to the Police Investigation of Certain Child Sexual Abuse Allegations in the Catholic Diocese of Maitland-Ne, Adelaide Catholic Archbishop Philip Wilson, Commissioner Cunneen, David Shoebridge, Detective Chief Inspector Peter Fox, Inspector Beth Cullen, Joanne McCarthy, Lewin Blazevich, Lewis Blayse, Margaret Cunneen, New South Wales government, New South Wales Inquiry, New South Wales parliament, NSW Inquiry, Peter Fox, Peter Gogarty, St. Pius X High School Newcastle. Bookmark the permalink.